Choom Gang and Obama: Remember when the NY Times suggested Obama exaggerated about his drug use? Remember When the NY Times Suggested Obama Exaggerated About His Drug Use? 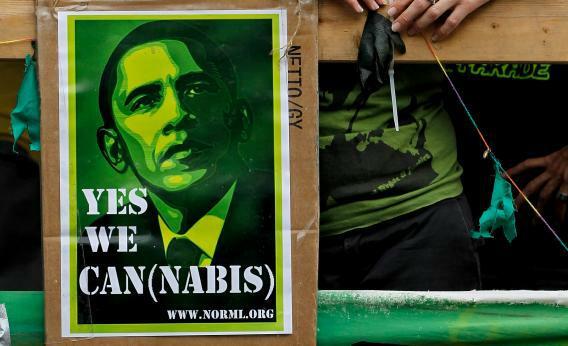 An artist’s satirical portrait of U.S. President Barack Obama at the Hemp Parade, or ‘Hanfparade’, on August 7, 2010 in Berlin, Germany. It’s funny to think that this was one of the major stories vetting Obama’s drug use during the 2008 campaign, and it actually ended up underplaying the extent to which drugs were a part of his life in order to depict him as a fabulist. The Times line about Obama only “dabbling” in marijuana could very well be true (depending on your definition of dabbling), but that does not lead to the conclusion that drugs were a “bit part” in his life. “Junkie. Pothead. That’s where I’d been headed: the final, fatal role of the young would-be black man,” he penned in the memoir. Mr. Obama describes a scene in that period where, in the meat freezer of a deli, he watched someone named Micky — “my potential initiator” — pull out “the needle and the tubing,” apparently to shoot up heroin. Alarmed, Mr. Obama wrote that he imagined how an air bubble could kill him. That sounds much more in line with the Obama of Dreams From My Father than the one from the Times. I bring this up not to rag on Serge Kovaleski or the Times for running this piece four years ago, but just to say that even if what we’ve seen of Maraniss’ reporting about Obama’s drug use and poetry and ex-girlfriends so far seems trivial, it is actually very impressive and the kind of stuff that is worthwhile to accurately have on the record.